The Arm Immobilizer provides arm support for injuries and a variety of pre- and post-op indications involving the shoulder, elbow, proximal or mid humerus, and wrist. Available with or without an Abduction Pillow, the Arm Immobilizer is engineered with new features designed to provide secure and comfortable support. The innovative adjustable tri-strap design (back strap, shoulder strap, and under-arm strap) customizes fit while ensuring desired forearm elevation, horizontal angle, and support. Together the underarm and back straps restrict posterior arm mobility and help off-load pressure from the neck area helping to reduce pain. 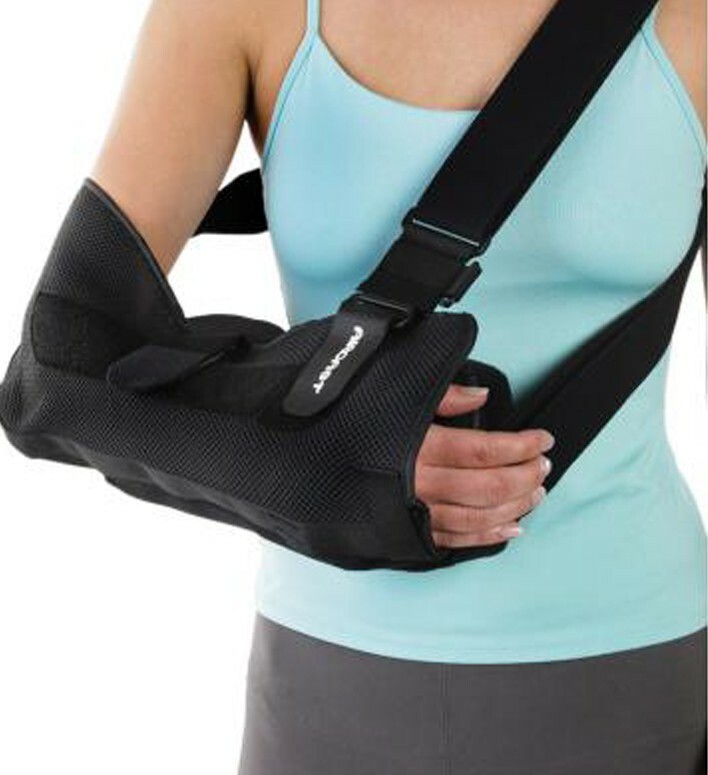 The Immobilizer is easily opened with a single strap for protected controlled motion and has an integrated hand guard that prevents the arm from inadvertently dropping. Durable mesh Immobilizer fabric helps keeps wearer cool and dry. The Abduction Pillow, available with the Arm Immobilizer, positions the arm at an angle from the body to help promote healing. Manufactured from soft foam, the contoured Abduction Pillow comfortably supports the arm to off-load the shoulder and is indicated for such situations as rotator cuff or Bankart repairs. Universal in design the Arm Immobilizer fits either the left or right arm. Proximal humerus, AC joint, or clavicle fractures in acceptable position. Reduced shoulder dislocations, rotator cuff or bicep injuries. Post-op and injuries about the shoulder girdle for which immobilization is appropriate. What materials is the sling made from? the left one. I have no muscle left, there's bone on bone and the clavicle is way out of line. I am 46 and it looks like my future will include a shoulder brace unless research discovers a way to regenerate or reconnect the nerve. Do you have a suggestion or do you need more information? This is a comfortable brace. It has the tri-strap design that helps to take stress of the neck, as you would find in a standard sling. If you are going to be wearing the brace long term I would recommend this style of strapping. Also, when thinking long term I'd recommend that you get the pillow to go with it. This will create a more comfortable position for your arm to sit and the thoracic outlet. I would also advise that you to contact your doctor for more tips on pain control. Please feel free to contact us with any more questions. To clean your product you can hand wash it with mild detergent, water and let it air dry. This sling was a huge improvement for me over the much more expensive Healy Weber sling that I'd been wearing for 6 weeks. Prior to my shoulder surgery, I'd also had issues with a bulging disc at C5-C6 which had caused radiating pain down my other arm. So while my left arm was recovering from surgery, my right arm was actually in more pain due to the sling. The design of the Arm Immobilizer was a perferct fit to my needs because it keeps the wight on my opposing shoulder and off of my next. Plus the lightweight construction is great for keeping your arm from overheating in warmer temperatures. I couldn't be happier with it. I have had four cuff surgeries and am now having a total shoulder done. Can not beat this sling for comfort and pricing. With or without the pillow it does the job. I was hesitant to purchase this but the immobilizer I was given after surgery was the most uncomfortable thing invented! I decided to go for it ... best purchase ever! This sling is not only comfortable, but is so much cooler than my previous one. This has alleviated my neck pain that the other one was causing. My arm is immobilized and there is no cramping or aching in my shoulder. I had surgery on my shoulder July 7 and will be in this contraption until at least December, so I needed something that would be comfortable and easy to use. I highly recommend it to anyone who needs one! Thanks for a great product! Cons: Getting it set up was a little tricky but once we figured it out, that was it. The instructions are straightforward .... but ... I had to switch the sling as it was my left shoulder that was operated on, so we had to reverse the instructions. May be more expensive but definitely worth it for comfort and support! I purchased this brace for a broken clavicle and shoulder injury. The standard cheap sling put too much strain on my neck causing more pain than comfort! The extra straps and configuration of this brace eliminated the strain on my neck muscles and provided extra support. The optional pillow is definitely worth the extra money for comfort and immobilization. Highly customizable and distributed the weight across my shoulder so much better than the standard issue sling. A little confusing at first because of all the straps, but once you get that figured out it's super easy to take off and put back on. I'd recommend it to anyone who has to wear a sling. This brace saved my neck and back from the pain the other one was causing. Pros: Customizable, fits even a small framed gal, sturdy. It is a good poduct. This brace was very comfortable to wear. Product is well made and for the job it did very well. Price was very affordable. Thank you Better Braces for providing a great product.